Graduations mark an important milestone in you and your child's life. School is out, summer is back, and family & friends are ready to get together to support their grad. We also know it can be a very busy time to plan the right party. Family and friends will gather either inside your home, backyard, or at a venue of your choice and there is no need to spend time shopping and cooking for your graduation party. With our catering services, we can deliver food right to your door and allow you to enjoy the day! We typically recommend a buffet style menu because it allows for flexibility and guests love it. Buffet graduation catering allows your friends and family to eat when they would like and allows everyone to spend time interacting and having fun. 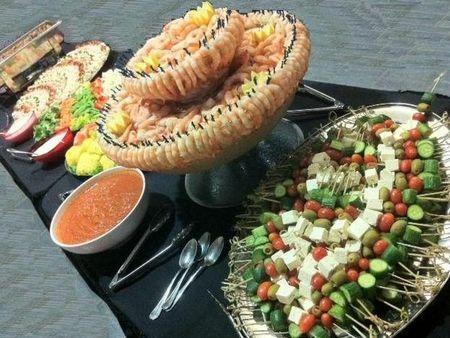 If you’re expecting a large gathering for your graduation party, you may want to consider a spread which consists of several finger foods or items which can be picked up and eaten in a couple of bites. With larger crowds and only one buffet, you may risk the food & beverage area getting overcrowded. Planning for many people and having designated areas throughout your home or party area with quick eats will help keep the crowd spread evenly and able to mingle easily. Be sure you are using smaller plates, which will make each serving look larger. We also recommend having an area where you can showcase photos of the graduate and accomplishments. And finally, don’t forget to include your deck or patio area if weather permits!